Thank you for visiting our mission trip’s blog page! Our tight-knit team of five (for introductions, see further below) has arrived safely in Japan & had a successful first few days on the mission field. For those of you who may not be aware, Japanese Christians make up less than 1% of the 127 million population. That is equal to about 1 in every 200 people. Our key purpose is to share the gospel to a nation that is desperately in need of knowing Jesus. Keishi K. has been leading an annual mission trip to Japan since 2009, but the main focus of service pivoted following the 9.1 magnitude earthquake / tsunami that occurred in northern Japan on March 11, 2011. Kamaishi was among the cluster of coastal cities heavily impacted. Around 22,000 citizens were killed, and thousands more are still listed as missing. Over 300 billion US dollars worth of damage was done. This was truly a tragic natural disaster to say the least. To visualize and better understand the extent of what took place on this day, please watch this video coverage; but be warned - it is hard to watch. Horror. Shock. Destruction. Heartbreak. Why, Lord? Though we may not ever fully understand His mysterious reasoning behind this catastrophic disaster, we have been given clear instruction as Christ followers on what to do in such situations. During a conversation with a Peruvian missionary residing in the Kamaishi area, we were encouraged to hear that prior to the 2011 earthquake & tsunami, Christianity evidently was basically non-existent in the area. It was not until groups like our team came as volunteers and loved on the survivors in small, tangible ways that Jesus was slowly introduced. Keishi and his wife Andrea have been able to see improvements and growth through the years they have been coming to serve. The property being used for outreach is owned by the government. By law, religious activities are prohibited in these locations. Therefore, it was deemed inappropriate for us to come and share about Christianity. However, due to the faithful work of missionaries on the ground, relationships have been fostered with the local government. Slowly but surely, as we return each year, we are now able to share more boldly about our beliefs. Praise God! As the video above mentions, the majority of the remaining population in Kamaishi and the surrounding towns consists of elderly people. Some still live in temporary housing units roughly about half the size of an average American garage. Some lost their spouses, children, and other relatives and friends in the natural disaster. Some recall stories of survival - running and holding on for dear life. A servant-hearted couple (Mark & Wendy, we love you!) felt a calling to move to Kamaishi after serving many years in Tokyo. Thanks to them, our team was able to help facilitate gatherings and fellowship with Japanese survivors whom they continue to develop friendships. Their hope is to one day plant several house churches. Each member of our team shared their testimony and profession of faith during at least one gathering. Participants chose the Japanese Kanji Character for Peace, Hope, Love, or Joy & created a craft. Keishi shared “You Are Special” by Max Lucado in Japanese - a non-threatening, soft evangelism tool! Of course we did not miss worshiping and dancing for our Creator! 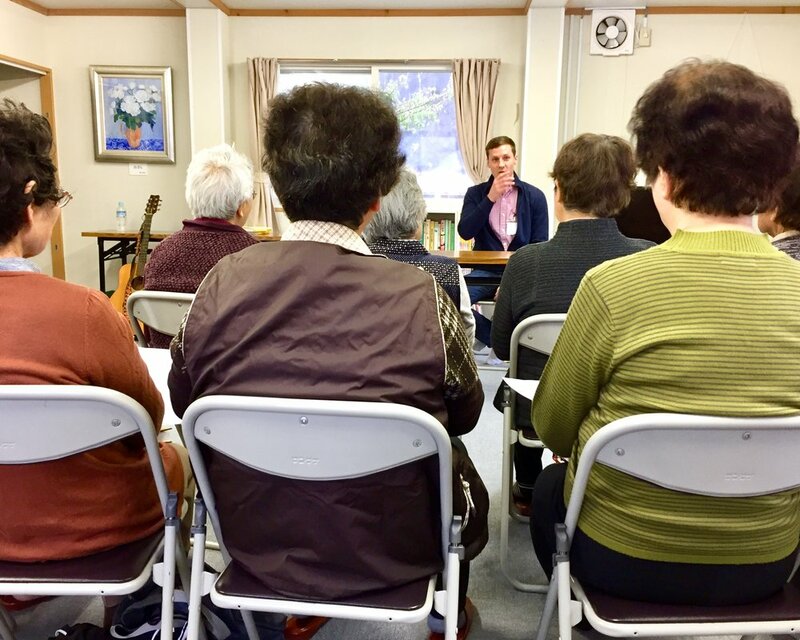 Though our time in Kamaishi is quickly coming to a close, up next we are connecting with another missionary couple in Sendai - another coastal city that was affected in 2011. Afterwards, we are headed to Tokyo to work with a homeless ministry. Additional updates are to come… so please revisit our blog! Please also continue to pray that the Lord will soften the hearts of the Japanese people we come in contact with & that He will create divine appointments along the way! Keishi is a native to Japan but moved to America for work in 2001. He is currently also a student at New Orleans Baptist Theological Seminary (NOBTS). He accepted Jesus Christ as His Lord and Savior and was baptized / became a member of Johnson Ferry Baptist Church in 2001. Andrea K. is originally from Florida but was in Japan teaching English when she met Keishi. After they got married, Andrea moved to Japan for 10 years where they had two children: Chris and Mari. You may know Andrea from her passion for dance, as she has served in JFBC's pre-school ministry through "Teeny Tykes & Tunes" and at "Night of Hope" each month with the prayer ministry. This mission trip is Lee C.’s first time in Japan (and first time trying sushi). He recently celebrated his 15 year wedding anniversary and has two children. God impressed upon his heart a strong desire to share the good news with not only the people of Japan, but especially his lifelong friend and his family who lives in Osaka, Japan. Blair joined Keishi and Andrea on their mission trip to Japan in October 2011, right after the earthquake and tsunami hit. During this first trip to Japan, God placed a burden on Blair's heart to share God’s grace in the nation. God opened up many doors, and he has now been living in Tokyo since 2014. He uses his career to minister within his sphere of influence in the workplace. Newer PostSevierville, TN: 30th Trip Arrival Night - Welcome Back!